Significant change to the structure of the Junior State Cup will see 439 teams participate in the 2019 version. 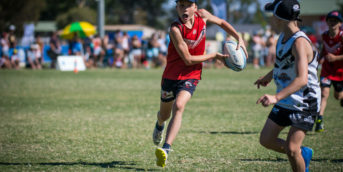 The NSW Touch Football Junior State Cup has had outstanding growth since inception in 1996 and now with the evolution from one event to two Conferences has created another significant growth spurt. Throughout time, this significant growth has seen the event outgrow any venue in which it could be held. 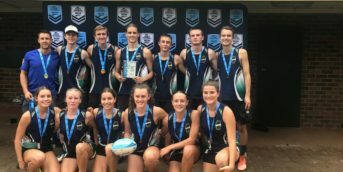 As such in 2017, NSW Touch Football advised that the 2018 Junior State Cup in Port Macquarie would be the last of it’s format and a new structure introduced to allow greater participation and access to all junior players across the State. The new structure would include two Conferences; a north held in Port Macquarie and a South held in Wagga Wagga. Both locations improving the accessibility of the State’s Junior players, particularly the South which had been impacted due to travel, cost and limited accommodation opportunities. This would also be followed by a State Final to be held in Wollongong in April, where the top 8 in each division would qualify and be able to decide who is the State Champion. The expansion to two Conferences has also seen the inclusion of the 8’s Boys and Girl’s divisions for the first time. The 8’s divisions will not progress beyond the Conference play for 2019 and also the structure change has allowed the reintroduction of Affiliates to also enter development teams in all divisions. The change has also seen the emergence of several Affiliates into the Junior representative space for either the first time or returned after a long absence. In 2019 we welcome Coolamon, Goulburn, Griffith. Kyogle, Milton Ulladulla, Temora and Yass back to the Junior representative fold. Sport Manager of NSW Touch Football Daniel Rushworth is pleased with the outcomes “The growth of 82 teams in a single year is an exciting result and to have both events so well supported is phenomenal and something we can not thank our hard working Affiliates enough for” He added “For the inaugural year of this structure, we will have the Northern Conference contested by 236 teams and the Southern Conference with 203 teams which is above expectations”. lCootamundra to host 40 teams for 35th Knockout!